Now a days, everybody does not want to compromise with anything. Same story is with the new technology which includes all gadgets like cellphone, laptops, mobiles etc. Today, These gadgets becomes a primary for people that have many activities in cyber world. 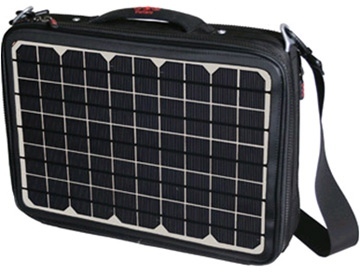 The Voltaic Generator is the first solar bag powerful enough to charge a laptop. This solar laptop charger has high-efficiency cells and includes a battery pack custom designed to efficiently store and convert the electricity generated. It will also charge cell phones and most other hand held electronics. Solar panel generates up to 15 watts using 20% efficient cells, enough to fully charge the Voltaic battery in about 5 hours. The included battery pack stores the equivalent of a typical laptop charge and automatically delivers the required output voltages. If you are think that this stuff is brittle and easy to break you are wrong, the fabric of this bag is made from recycled PET which makes this stuff tough and water resistant. Technical Specifications: Material: 600D shell made from 100% recycled PET (soda bottles). Webbing, mesh and 150D lining all made from 100% recycled PET. Aluminum frame covered in UV resistant PU. Aluminum and PU hardware. Silicon handle. Weight: 4.5 lbs (2,050 grams) including solar panel and battery. Dimensions: 17"x12"x 3.5" (43x31x9cm) -- will hold up to a 17" MacBook Pro Volume: 700 cubic inches (12 liters) In addition to a laptop plug the bag includes adapters for phones, USB devices and a car charger, and there's a battery inside the bag to improve the efficiency of the panel and to keep the juice flowing when you're in the shade. It all sounds great, but the bad news here is the price: $599. Yeah, your money might be better spent on a few spares batteries, but if you're going to be spending a week or so away from plugs, the Voltaic Generator just might be the ticket.